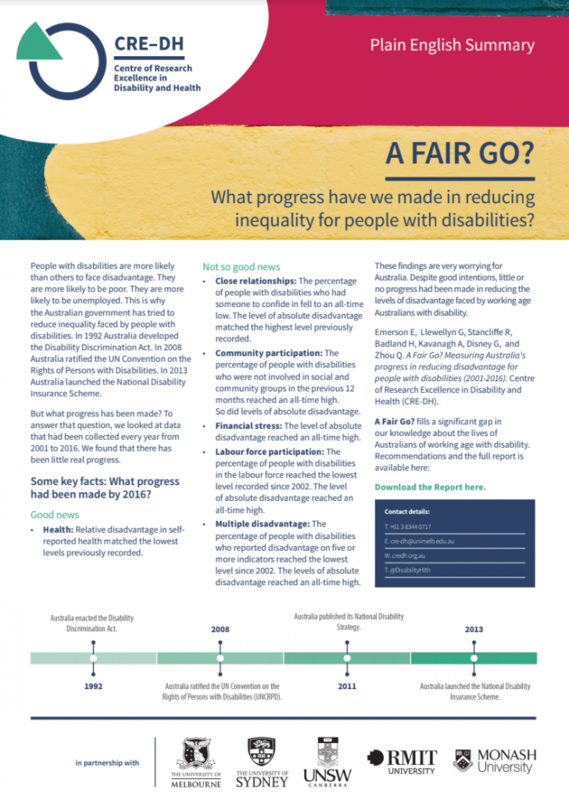 What progress have we made in reducing inequality for people with disabilities? People with disabilities are more likely than others to face disadvantage. They are more likely to be poor. They are more likely to be unemployed. This is why the Australian government has tried to reduce inequality faced by people with disabilities. Australia developed the Disability Discrimination Act in 1992. In 2008 Australia ratified the UN Convention on the Rights of Persons with Disabilities. In 2013 Australia launched the National Disability Insurance Scheme. But what progress has been made? To answer that question, we looked at data that had been collected every year from 2001 to 2016. We found that there has been little real progress. Some key facts: What progress had been made by 2016? Health: Relative disadvantage in self-reported health matched the lowest levels previously recorded. Close relationships: The percentage of people with disabilities who had someone to confide in fell to an all-time low. The level of absolute disadvantage matched the highest level previously recorded. Community participation: The percentage of people with disabilities who were not involved in social and community groups in the previous 12 months reached an all-time high. So did levels of absolute disadvantage. Financial stress: The level of absolute disadvantage reached an all-time high. Labour force participation: The percentage of people with disabilities in the labour force reached the lowest level recorded since 2002. The level of absolute disadvantage reached an all-time high. Multiple disadvantage: The percentage of people with disabilities who reported disadvantage on five or more indicators reached the lowest level since 2002. The levels of absolute disadvantage reached an all-time high. These findings are very worrying for Australia. Despite good intentions, little or no progress had been made in reducing the levels of disadvantage faced by working age Australians with disability. A Fair Go? fills a significant gap in our knowledge about the lives of Australians of working age with disability. Read the Plain English Summary (pdf file). 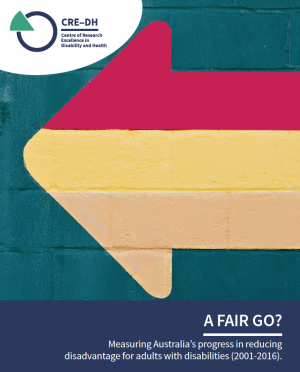 A Fair Go? 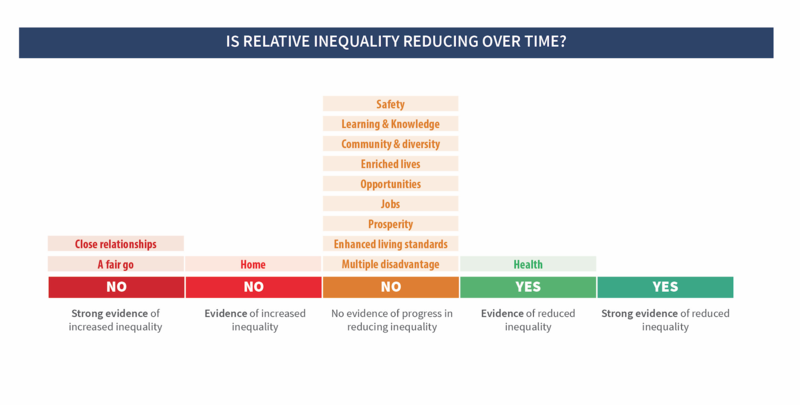 Measuring Australia’s progress in reducing disadvantage for people with disabilities (2001-2016). Emerson E, Llewellyn G, Stancliffe R, Badland H, Kavanagh A, Disney G, and Zhou Q, Centre of Research Excellence in Disability and Health, July 2017.